In today's automotive construction and other manufacturing industries, one hundred percent monitored and at the same time fully automated processes using 3D robot guidance are key in achieving greater flexibility and higher productivity. Up until recently, the problem was finding a way to automatically remove unsorted parts from transport containers. The SHAPESCAN3D sensor represents a highly flexible and cost effective solution for a process referred to as bin picking. It makes use of the plug & automate concept so that even users without any expert knowledge can quickly install this solution and put it into operation. With it, the need for complex mechanisms or manual sorting applications becomes a thing of the past. The SHAPESCAN3D sensor allows robotic bin picking. The positions of unsorted randomly distributed objects in different depths of large containers can be determined three-dimensionally with moving laser lines. In the automotive and manufacturing industries, the challenge facing assembly technology has always been to find a continuous way to remove parts from transport packaging, such as box-type and Euro-type palettes and boxes and to feed them to an assembly or processing system. More often than not, processes offered in the past did not hold up to the needs of the day-to-day tasks: For example, some production facilities managed by ordering products delivered sorted, even though this solution comes at a significantly higher cost and logistical effort. Normally, parts are delivered by specific product, but not sorted. The disadvantage of having to remove products manually is the need for additional labor. Though this is a monotone task, it does not leave any room for mistakes and it is in stark contrast to the goal towards a more flexible automated production process. Up until now, most of the time it involved mechanical processes. Work pieces were sorted using vibrating feeders and other complex procedures. More often than not, these mechanical solutions are very costly and not very flexible. For each new work piece, a new feeder bowl and a new feed line is needed. What's more, they in turn are prone to wear and tear and need cleaning. Not to mention the noise involved, for example when dumping the contents from the bins. Machine vision systems make use of robotics for this application and have as such been proven to reduce costs and increase flexibility. Being able to pick things out of the box directly, also referred to as bin picking or random bin picking, comes with quite a few advantages as compared to mechanical sorting options: A high level of flexibility in the different variations of components that can be sorted, because no sorters are required that need to be designed based on the work piece. In addition, costs are lower due to a significantly smaller number of mechanical components. However, 2D camera systems do not stand up to this task, because this kind of solution often fails due to the difficult contrast conditions and because of the inability to see in depth. As applications in day-to-day operations have shown, special 3D sensors by ISRA VISION have proven to be a perfect solution for automated bin picking. The SHAPESCAN3D sensor utilizes two standard cameras and special laser illumination that makes it possible to exactly define the position of each part in the box. The entire expertise for automated bin picking, which includes the capability of seeing in three dimensions and to accurately determine the position of unsorted objects at any height, is now being made available to users by a "plug & automate" solution. It includes the SHAPESCAN3D sensor and can easily be installed and put into operation by the user themselves. Instead of complicated programming only a few simple parameters need to be set, making it easy to start working with 3D robot guidance. The GigE-based sensors are either stationary or portable. In addition, many other standard communication interfaces are supported, such as Profinet. The sensor can be mounted stationary above the bin. The standard sensor has a clear view of an entire bin the size of a Euro pallet. No complicated kinematics technology is needed for the sensor to work. That is why the system operates with such speed: The time needed to scan the entire volume is just a few seconds. The system works with a high degree of accuracy and can be used flexibly for a variety of bin sizes. The particular intelligence of this sensor technology is hidden in its sophisticated software. The 3D cameras scan the content of the bins and what results is a so-called 3D scatter diagram representing the objects to be captured. Geometric primitives are determined in a first step using the newly developed 3D shape sampling evaluation method. The software then compiles more complex objects based on these primitives. This way, it is possible to identify differently formed parts of objects. This guarantees that the geometry of parts can be reliably detected, even if the objects are unsorted. Projected laser lines are used to determine the orientation of the object parts in depth. This allows the sensor to "see" in the third dimension. 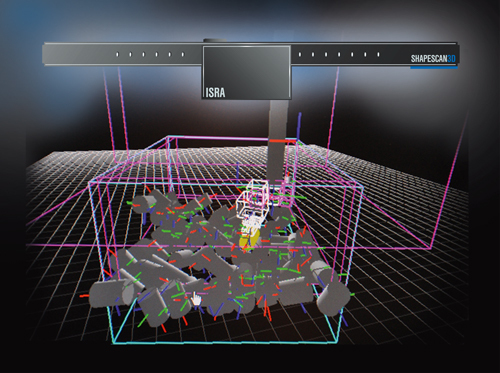 The "in-depth view" allows the robot to empty the entire transport bin even without intermediate layers. All components in every depth are allocated clearly and made available for the robot. An intelligent algorithm helps to assure that the robot grippers and the bin do not collide and as a result the gripper does not come in contact with the side walls. The process is not susceptible to soil and dirt and is suitable for applications in rough industrial environments. The new 3D SHAPESCAN3D sensor allows users to determine the exact position and orientation of unsorted parts in a range of different depths of bins, supported by the new Windows-8-style 3D machine vision software. The SHAPESCAN3D sensors are a part of a large family of products. They allow simple solutions that are suitable for day-to-day operations even for the many applications that require exact and fast robot guidance. The sensors are combined with new software technology, into which ISRA VISION has integrated its entire problem-solving skills The software works on the new Windows-8-style user interface. The user has the ability to intuitively navigate through the system with the easy to use touch screen. With "plug & automate", users have the freedom to use automation solutions of the future today. The days when they had to rely on experts to efficiently automate their systems are now a thing of the past. Because of the simplicity of the bin picking tool, it will not take long until this new solution offered by ISRA is integrated into other applications and becomes the untouchable standard for bin picking. Production facilities can reap significant savings in terms of costs and production time. At the same time, the solution significantly increases an operation's production flexibility, while it is easy to install and while requiring very little additional space. Production cycles are increased noticeably. The system's return on its investment will be felt after just the shortest amount of time. Intelligent Systems Robotics and Automation - transforms years of fundamental research into industrial progress. Their innovative core competencies lie in the development of user-specific software for sophisticated, intelligent Machine Vision systems, firmeware & hardware.